At the outset, I wish to congratulate the Principal, Members of the Staff and Administration and the students of Zakir Husain College, on the occasion of their Diamond Jubilee Celebrations. I am happy to be amidst you all on this landmark occasion. 2. Zakir Hussain College is an institution that stands symbolically connecting the boundaries of a sprawling new city, with the margins of the old walled city inside the imposing Turkman Gate. It is an institution that symbolizes the fruitful confluence of tradition and modernity, not only today, but ever since its inception as an oriental college of arts and science almost two hundred years ago. In its early years, the college commendably fulfilled the task of making the people of the city of Delhi the need for modern education irrespective of their cultural, religious or class backgrounds and stone to synthesize western education with oriental learning. It is the simultaneous propagation of Indian and western classical learning that makes the college a premier institution set the stage specifically for what came to be known as the ‘Delhi Renaissance’. At the same time it also ensured the progress of modern education in northern India in general. 3. I am happy to learn that Zakir Husain College has always upheld the spirit of confluence and syncretic traditions by translation of Arabic and Greek Classics and Persian works into Urdu. At the time when even Britain could not make higher education open to its own general public, the “Dehli College”, as it was popularly known, was translating scientific and mathematical treatises from Arabic and Sanskrit into Urdu and making them available to its students. Some of the best scholars of western and eastern sciences came together in this college and brought Delhi effect the Delhi Renaissance just before the First War of Independence (1857). 4. In its early stages of development this prestigious college became a centre of learning for people from different states of north India. It developed a high reputation as a centre of learning where a dialogue between the western and the eastern curricula was possible. According to Dr. Abdul Haq, a well known historian of the institution,“Delhi college could do what Fort William College could not do” in Calcutta. The pre-eminence of the institution over the other institutions of the country was possible because even when English occupied the central place, most of the men associated with the Delhi Renaissance had a traditional oriental education. They came into contact with western ideas through translations. These intellectuals gave secondary value to English in a primarily vernacular curriculum. The college from the very beginning had an atmosphere of relaxed coordination about it. Since the students were not forced to learn in a foreign language, there was nothing but respect for the western culture and language. The lack of animosity in the students and the ambience of the vibrant Ganga-Jamuni Tehzeeb always remained a cause of surprise and often anxiety to the British. 5. Even in the era after the partition, the college was always regarded as a nursery of scientific and language teaching. It played a pioneering role in popularizing science and rationality while producing some very eminent writers, actors and artists. One of the well-known academicians associated with the college, Prof. Khwaja Ahmad Farooqui said that the Delhi College ushered in a new era — an era that still continues. 6. Zakir Husain College exemplifies the ideals that represent India. These are the ideals of inclusivity, tolerance, acceptance and co-existance. I am informed that the students and teachers of the college come from a variety of backgrounds and communities. It is because of the directive principle of the College, of accommodating dissent and disagreement that it has produced great thinkers and writers in almost all the major languages known and spoken across India and the world. 7. I am happy to learn that Zakir Husain College prides itself in having students from various states of the nation who consistently provide new lifeblood to the spirit of confluence and syncretism. It reflects the old values of the Delhi College of the 19th and the 20th centuries. Even today it is a proud representative of the Ganga Jamuni Tehzib of Delhi. The soul of the historical Delhi, still survives in its modern day avatar. 8. I firmly believe that the strength of a nation and its quality is reflected by its youth. As a nation we are still faced with poverty, malnutrition, unemployment, and many social evils that remain as hurdles in our path to glory. I implore the young minds present here to employ their knowledge and expertise in assisting the nation to overcome these challenges. You are the inheritors of a great college, a great tradition and a nation unfolding. It is now your duty to leave a history, a heritage behind. It is you, who must ensure that the benefits of the government’s efforts reach the society at large and the common man in particular. 9. The path to overcome the challenges faced by our nation has to be holistic. We must aspire for an empowered and enabled youth. It is imperative to invest heavily in their education and health. They must be nurtured into becoming compassionate and responsive citizens. Therefore, the primary purpose of education should be to equip the young minds with skills for self development so that they become productive social assets. At the same time education must simultaneously inculcate a sense of national and social consciousness within them and foster them into compassionate individuals. Only then, they can contribute meaningfully towards nation building. 10. We should ask ourselves, what kind of nation are we? What kind of nation do we wish to be? We have centuries of history behind us. The myriad of cultures that India has hosted, have woven themselves into the very fabric of Indian society. You, the youth of our nation must proudly carry forward our rich history and tradition of compassion. The beauty of India lies in the celebration of this diversity. Our diversity is the synthesis of centuries of assimilation, adaptation and subsequent evolution of various cultures. In a world of increasing animosity, peaceful coexistence becomes our asset. This asset has been and shall always remain our biggest contribution to the world. This is the Indianness that the world knows about - of warmth and hospitality; co-existence and symbiosis. Education plays an indispensable role in imparting and perpetuating these values. 11. This synchronicity of education, innovation and harmony, is beautifully elucidated in the words of Gurudev Rabindranath Tagore, as is evident from the quote from his ‘Ideal of Education’ and I quote, “University is there to offer us opportunity for working together in a common pursuit of truth, sharing together our common intellectual heritage, to enable us to realize that artists in all parts of the world have created forms of beauty, scientists discovered secrets of the material universe, philosophers solved the problems of existence, saints made spiritual truths organic in their lives, not merely for some particular race to which they belonged, but for all mankind. 12. 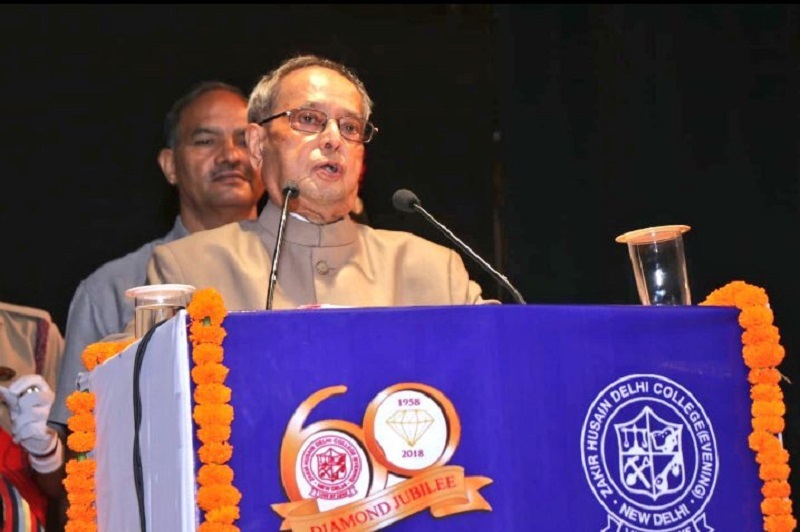 I once again congratulate you all on the Diamond Jubilee Celebrations of this prestigious College. And I thank the Chairman, Principal and the College for inviting me to be amidst you all today.